With New Year’s looming just around the next snowdrift, it only makes sense to look back one last time at 2016 and unpack Part Three (click here and here for Parts One and Two) of our Film Independent Year-in-Review. So before you head out on to click champagne glasses and sing “Auld Lang Syne” here are a few things you should know about what exactly Film Independent did in 2016. As we’ve said, Film Independent’s mission—in 2016, and every year—is to help diversify the film industry, assist filmmakers with the making of their projects and helping to build an audience for those projects once they’re finished. And as always, none of these things happen without support from folks like you. This time, we want to focus on the “building an audience” part of our mission. And luckily, there’s a lot to talk about. 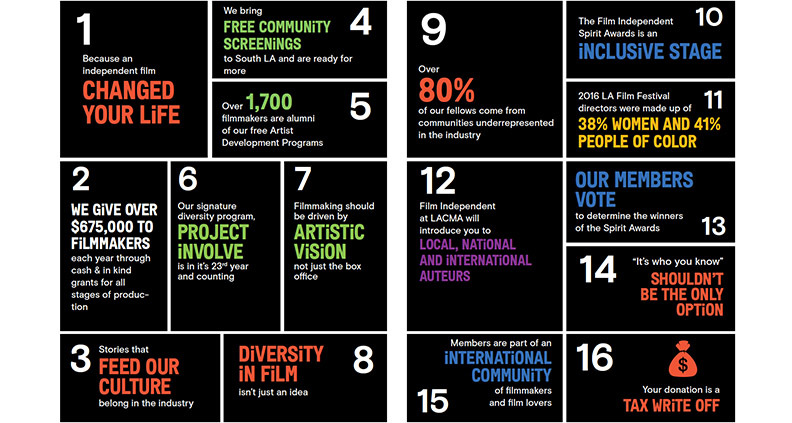 2016 was an incredible year for continuing to build and bring together members of our extended network of film lovers and filmmakers, be it at the LA Film Festival, Film Independent at LACMA, Forum or any of our myriad other audience-centric programs. Of course, “building an audience” really means building a community. That means bringing likeminded people together, IRL and otherwise, to share their experiences—whether it be career advice, professional networking, education, panels or simply gathering to watch a screening of unique new indie film that might otherwise languish unwatched in the VOD hinterlands. It all adds up to create an environment where independent voices can both survive and thrive. A little further west, in Santa Monica our other tent pole fundraising event—the Film Independent Spirit Awards—also had a great year, being broadcast in a whopping 53 countries. This year, Film Independent at LACMA hosted 54 screenings and events, including Q&As with artists and creators including Barry Jenkins, Natalie Portman, Whit Stillman, Robert Kirkman, Sarah Silverman, Adam Driver, Yogos Lanthimos and (holy cow!) Oprah Winfrey. Film Independent at LACMA also saw the continuation of Film Independent and Jason Reitman’s popular Live Reads series. For the first time, Live Reads also went bicoastal this year with a pair of performances in New York: in May with Hannah and Her Sisters (guest directed by Olivia Wilde) and again on October 7 with Good Will Hunting, with stars Matt Damon and Ben Affleck reprising their iconic roles for guest director John Krasinski. 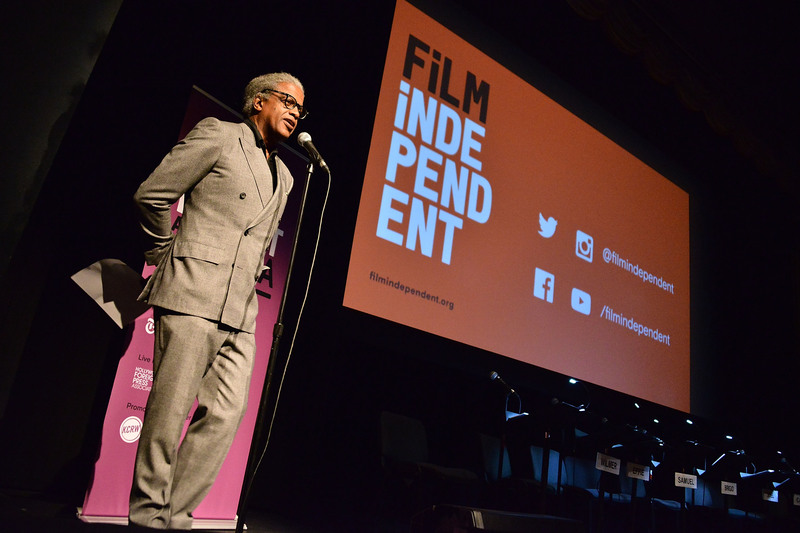 In 2016, Film Independent expanded to over 6,000 Members, with Members in all 50 States and the District of Colombia (the last domino to fall was North Dakota). Lastly, our 2016 educational programming was more robust than ever, with 59 events held over the course of the year (54 of which were free to Members). The educational events featured 139 panelists, serving the over 6,000 filmmakers and film lovers who attended. In other words, we had a lot of fun—and we hope you did too. Please consider supporting Film Independent by making a donation. All gifts received or postmarked before December 31 (there’s still time!) are allowable for your 2016 tax deductions. And for more, you can read our entire annual report here.